3 Tangerines, 2018, 14" x 11," oil on canvas. I Have 5 oil paintings, an acrylic one plus an ink drawing in current or upcoming exhibitions. I'm participating in a group show & sale at the Plastic Club Art Gallery, 247 Camac Street, Philadelphia, PA. My acrylic painting "3 Tulips in a Blue Pitcher" is in the exhibition "reconfiguration," which features mostly abstract work. So, my painting stands out a bit; however, I consider the transformation of three-dimensional objects into two-dimensional paintings to be a form of abstraction. The show & sale ends December 27. The hours are 2:00 pm to 5:00 pm. If you find yourself in Philly over the next two weeks, check it out! It is a great opportunity to find that special something for someone! 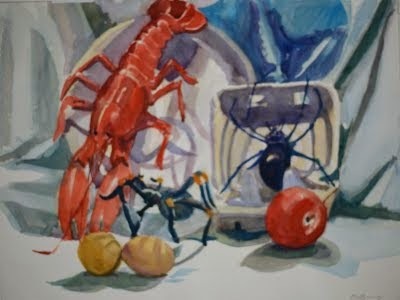 My painting "3 Tangerines" will be on view at the Art Students League of New York's annual holiday show and sale. If you're looking for a unique but not too expensive gift, I suggest you check it out. When: Tomorrow until December 21. Where: Phyllis Harriman Mason Gallery, Art Students League, 215 West 57th Street, NYC. Hours are 9 am to 8 pm, Monday through Friday; and 9 to 4 pm on weekends. I'm participating in a group pop up exhibition and sale in Chelsea. I have 4 oil paintings on view, all for sale! My painting "Cosmos and Strawberries" is one of them; "2 Eggs in a Glass Bowl," another. 2 Eggs in a Glass Bowl, 2017 12" x 12," oil on canvas. The opening is this Thursday, December 13, from 6:00 pm to 8:00 pm. I'd love it if you could make it (I will definitely arrive by 6:00, and I will stay until at least 7:30). The address is 144 10th Avenue, NYC. If you can't make the opening, you will still be able to catch the show. It will stay up until the 19th. Hours are noon - 7:00 pm. I'm also participating in "Postcards from the Edge." It is an annual benefit for Visual AIDS. The organization raises money for AIDS awareness and prevention, and supports HIV positive artists. I'm not at liberty to show an image of my artwork, but I will have a "postcard" on view and for sale!. The event takes place February 22 -24, 2019 at Bortolami, 39 Walker Street, NYC. A Coney Island Nightscapes Series: Cyclone, & More. Cyclone, Coney Island, 2017, 26"x 38," watercolor, gouache & pencil on paper. (c) 2017. I'm thrilled to announce my participation in a summer invitational at the George Billis Gallery. 525 West 26th Street, Ground Floor, NYC. The show will be up until August 18. &, everyone is invited! My painting in the show (shown above) is one of many nightscapes I've painted over the last 4 years and part of a Coney Island series I started last summer. Urban nightscapes have long been a source of fascination to me. In particular, I love the way a combination of darkness and electric light can transform massive steel and concrete structures into twinkling, ethereal apparitions: Perceptions are as affected by light and its absence during the day, as well. But, the affect is most obvious after nightfall when darkness obscures most physical phenomena and all that can be glimpsed is what little is illuminated by electric lights. Most of us experience the world visually: As a continuum of visual impressions and images. The unreliability of that visual data is of unending fascination to me. I think Plato's allegory of the cave is the best metaphor to describe the phenomena. And, my nightscapes are meant, on one level, to be metaphors for the limitations of human perception. In Plato's allegory the inhabitants of a cave only see shadows cast on its walls; thus, they only partially glimpse reality, but never perceive it in its entirety. Likewise, after nightfall physical phenomena can only be partially glimpsed. The rest is guessed or imperfectly remembered from earlier experience and observation. Parachute Drop & Carousel, Coney Island, 2017, 26"x 38," watercolor, gouache & pencil on paper. (c) 2017. I guess I'm partially drawn to Coney Island by the sheer strangeness of the place: There is certainly nowhere else like it! There is no practical purpose or utility to it. Unlike other amusement parks, no unifying theme. Instead, Coney Island is a consortium of competing amusement ride operators. Its most prominent structures----its roller coasters and other rides----have no other purpose than to serve up ersatz experience: Instead of real danger, the rides provide a simulation of it. And, what a whirlwind of sensory perceptions! The neon and other illumination all about presents a dizzying array of visuals. All of which makes Coney Island the perfect subject for a nightscape painter like myself. Nightscapes of New York City, My Newest Series. When I walk around the city at night I sometimes feel as if I’m wandering through a gargantuan interactive light sculpture. But one that is more interesting and mysterious to me precisely because the effect is not the consequence of a grand design, but of something more haphazard and random: The aggregate of many individual efforts, mostly independent of each other, which coincidently, or not, adds up to a spectacular whole. watercolor, gouache & pencil on paper. So, not surprisingly, I decided to do a series of New York City nightscapes. I started a couple of years ago. However, progress has been slow. I’ve discovered that it is challenging to capture the hallucinatory quality that very bright lights have in the dark, but it has been rewarding too. To me, the nightscapes are evocative of everything I most associate with the city: A sense of anonymity, or aloneness despite the crowds; extreme commercialism; and, more than anything, the insignificance of the individual in the midst of a place this huge, this densely populated. To date, I don’t have enough paintings in my nightscape series for a solo show. However, I have completed a few that I am pleased enough with to have had included in an occasional group show. One such takes place July 9 - August 25, 2015 at the Manhattan Borough President’s Office, 1 Centre Street, 19th Floor. I gather viewing is by invitation only, though. Apparently security won’t let anyone into the building unless they have their name listed-----and then only with a photo ID. If you are interested in seeing the exhibition, contact me at margaretmontgomeryartwork@gmail.com and I’ll see what I can do. You could also try contacting the Art Students League of New York, since it is their show: All the participating artists are either students or members of the League. Or, you could wait until I have my solo nightscape show----but you’ll have to wait at least another year for that! All copyrights are reserved to the artist (c) 2015. 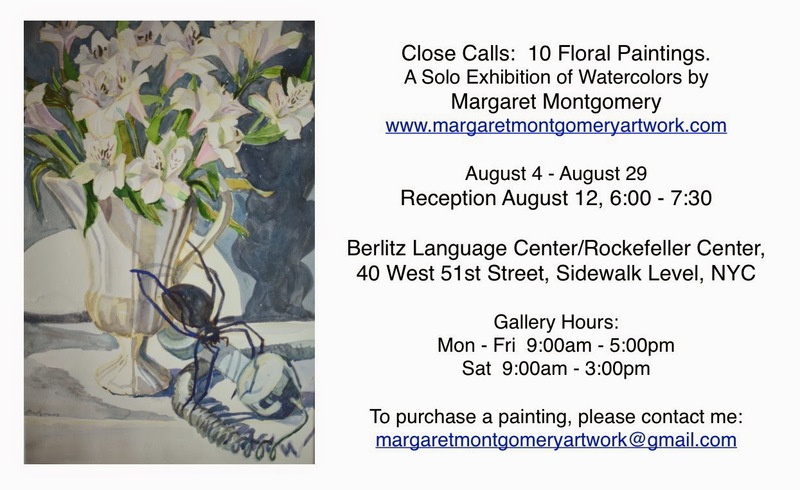 I'm Thrilled to Announce My Upcoming Solo Exhibition: Close Calls: 10 Floral Paintings. All copyrights reserved to the artist (c) 2014. Well folks, the opening date (August 4) for my second solo exhibition of the summer is fast approaching! I can't tell you how giddy I am with excitement! This is only my third solo ever; so putting an exhibit together still feels new to me----although I can't imagine having a show will ever seem old hat. 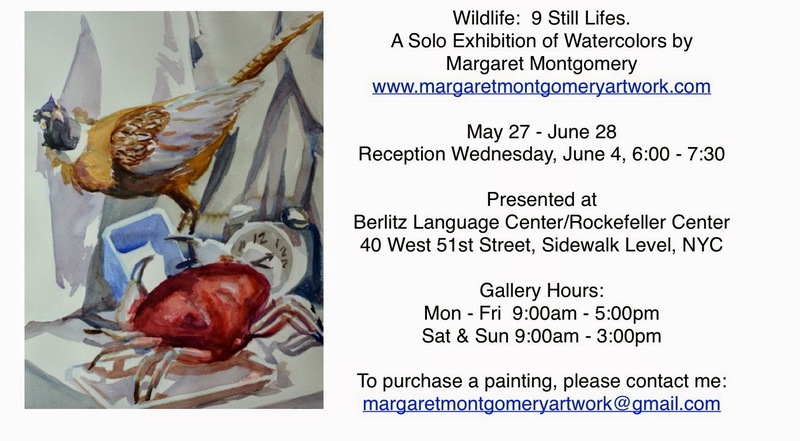 Before I go on about my new show, I want to briefly say some things about the last one ("Wildlife," May 27 - June 28). First, I was pleased to receive compliments regarding the individual paintings, and the show as a whole too. The creative process can be very subjective, so it's nice to hear other people respond positively to the end product. (It's very reassuring, too!) Next, I'd like to mention that I made one sale. While one sale is better than none, I have to admit I would dearly have liked to have sold more. I hope to do better next time! Lastly, I want to mention that I got quite the surprise when an old friend of mine who now lives in LA showed up unannounced: The conceit was that she had come to New York for my reception! As for my upcoming show, "Close Calls," let me tell you a bit about the paintings. They feature flora of one sort or another, with the occasional fauna or telephone; it is the florals, though, that give the show its unifying motif. These paintings, like most of my still lifes (and some of my cityscapes, too), reflect a Realist world view combined with Magical Realist flourishes----I know not everyone considers floral paintings to be "still Lifes" since flowers are not dead or inanimate, and as anyone who has ever painted them can attest, they can be anything but still! However, I use the term very loosely----But I digress! In my floral paintings, the central flower motif is paired with incongruous elements throughout: Goldfish appear to sail through the sky next to waterlilies; venomous spiders and/or ominously displaced telephone receivers are next to decorative floral arrangements; a jack rabbit’s shadow appears next to cacti, although there is no rabbit in sight. The pairings have a dissonance that suggests the accidental----purely chance----aspect of life. Leaving the viewer to wonder if they are looking at the aftermath of an incident, or not. I hope I have managed to pique your interest enough to entice you to come to my show! By the by, anyone who would like to come to my reception (Tuesday, August 12) is more than welcome to! Don't hesitate to drop by anytime during the show's run, either. The "gallery" area of the Berlitz language Center is entirely accessible to the public. No entrance fee, nor appointment is necessary. Close Calls: 10 Floral Paintings. Watercolors by Margaret Montgomery. Show runs: August 4 - 29. Monday - Saturday. Presented at Berlitz Language Center/Rockefeller Center, 40 West 51st Street, NYC. A Consideration of Gauguin and the Recent Exhibition of his work at the Museum of Modern Art. "Maruru" (Offerings of Gratitude), from Gauguin's print series "Noa Noa," 1893 - 94. A major exhibition that covers a significant period in a major artist's career can provide the perfect opportunity to consider their work anew, both individual pieces and as part of a larger body, too. A well put together show should bring the big ideas and themes that animate the work into sharper focus, too. And a great artist's career is about the evolution of the ideas and principles that constitute their aesthetic vision: As is the case with Gauguin, who is one of the most interesting and audacious post impressionist artists. And just how so, was apparent in the recent exhibition "Gauguin: Metamorphosis" at the Museum of Modern Art. It featured his prints and sculptures, which admittedly surprised me at first; because I've always thought of Gauguin as a painter, period. The prints are of interest, though. They encapsulate the major themes and motifs that appear throughout Gauguin's oeuvre; and show how he reworked and developed his motifs, familiar to most from his paintings. The prints are also beautiful works of art in their own right; although, they lack the paintings' vibrant color. They are, instead, quite dark and monochromatic: Individual images merge with like-hued surroundings, giving them an ambiguous, enigmatic quality. from the Suite Noa Noa, 1893 - 94. Gauguin rejected the Realism of the Impressionists early on in his career. Opting for a subjective aesthetic. Along with Emile Bernard, he developed Synthetism, characterized by flat shapes and vibrant colors. The style, so well known from his Tahitian paintings, is meant to convey the subjectivity of remembered experience rather than the neutral objectivity that is inferred when art is made from direct observation. While they lack the vibrant color of his paintings, the prints, as well as the sculptures, reveal Gauguin's conscious development of his unique art form; replete with his own symbolism and imagery, including semi-made up religious iconography----borrowed from various sources, including Buddhism, Christianity and Tahitian mythology. 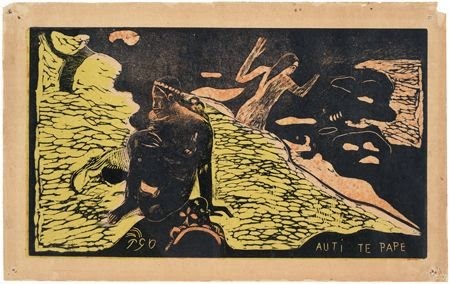 There are three print series in the exhibition, which Gauguin conceived of in narrative terms, of which my favorite is the so-called "Noa Noa" series, which, according to the exhibition's accompanying text, Gauguin produced with the hope of creating an appreciation for his early Tahitian paintings. (Apparently, they were not an immediate hit with the Parisian art market.) The series serve as a summation, of sorts, of all the themes and motifs that appear in Gauguin's Tahitian paintings: Encompassing something of a grand lifecycle, they range from creation to death; and include the aspects of the human experience that most preoccupied Gauguin-----love, fear, spiritualism. Indeed, I was already familiar with most of the imagery from his paintings; such as that of a Tahitian Eden featuring a very earthy Eve, as seen in the print "Nave Nave Fenua." In Polynesia, Gauguin's style was also inspired by the so-called "primitivism" of the culture. That was evident in the show, both in the prints and in the paintings. He incorporated many elements of "primitivism" in his later artworks, such as bold decorative designs and a disregard for proportionally correct representations of the figure. In his prints and paintings all of his Tahitian Eves , for example, have disproportionally sturdy legs and large, somewhat prehensile looking feet, giving them a particularly earthbound appearance----they almost look as if they are holding onto the ground! That is the case in his print "Nave Nave Fenua" featuring Gauguin's version of Eve----as well as in his earlier painting of the same title. To me, Gauguin's art always seems timeless. Perhaps, it is in part because it doesn't deal with objective reality, only imaginary entities and scenes: Nothing identifiable ties them to anything in particular. And, even though he used real-life models, the figures in his paintings are mythical entities or archetypal characters, not real people. Also his use of symbols, motifs and themes----much borrowed from various religions----is, while personal, also archetypal enough to be universally recognizable; and therefore resonate with a wider audience, across generations. But more than anything it is Gauguin's obvious conviction in what he was doing, apparent in the boldness and steadfastness of his work, that makes him such a compelling artist. I know, that makes me a believer as well. The Show Ended June 8. Museum of Modern Art, 11 West 53rd Street, NYC. Guess What! I'm About to Have My Second Solo Exhibition! And, Everyone is Invited! All copyrights are reserved to the artist (c) 2014. This summer I'm having two solo exhibitions. Not one, two! I can't tell you how thrilled I am to have an opportunity to show my work publicly. Artists always work with an audience in mind (forget about any platitudes to the contrary). I wouldn't go so far as to say that an artist needs an audience to validate their work, but the purpose of art is to make a visual statement with an eye toward having a cultural impact. After all, the creative process doesn't happen in a vacuum, every artist is influenced by their cultural, political and social environment and so it is only right that they would want to leave their mark on it, in turn. My first show opens later this month (May 27). 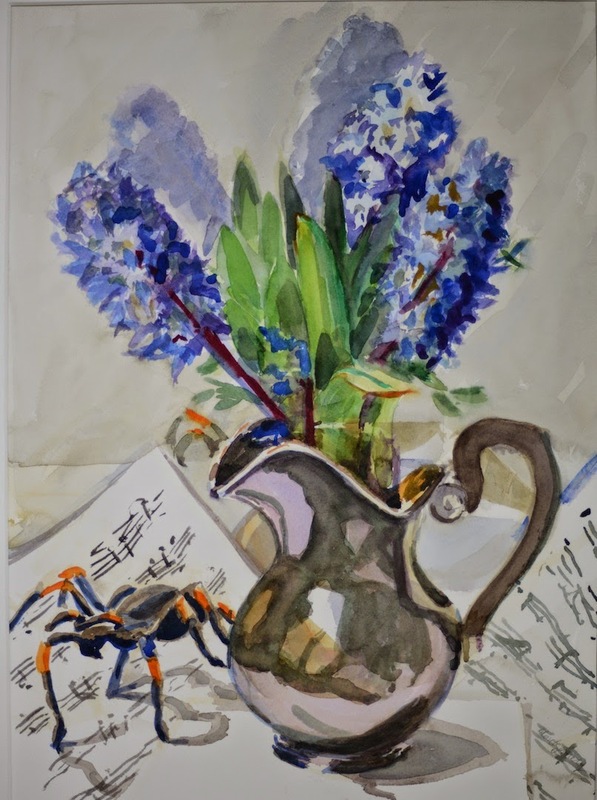 It is titled "Wildlife" and it is comprised of paintings from an ongoing series featuring crustaceans, occasionally with a bird or spider and with an eclectic mix of everyday objects. I juxtapose unrelated objects in all of my still lifes in order to create dynamic and interesting paintings. In this show, pheasants and plastic food containers; spiders and a disembodied Buddha head; crustaceans and alarm clocks; the addition of elements that confound and confuse can make for a more multilayered work of art. Some of the subject matter can be interpreted as symbol or metaphor, as well. For example, the juxtaposition of arachnids or crustaceans with manmade objects could suggest the relative brevity of human existence, but the enormity of our impact on the environment. Because crustaceans and arachnids go way back, millions of years, they are reminders of the vastness of geologic time: Crabs go back to the Jurassic period, 200-145 million years ago; lobsters and spiders the Cretaceous period, some 145 million years ago. In contrast we humans are but a blip on the geological time scale! And the overturned pitchers and empty or near empty plastic containers could be metaphors for the arbitrary and negative effect much of human activity has had. My artwork, by and large, reflects a Realist aesthetic; there is a recurring Magical Realist strain that runs through it, though. And, this exhibition is representative of that aspect of my oeuvre. Ordinary and everyday items are the subject matter of all of my paintings, regardless of whether they fall under the rubric of Realism or Magic Realism; however, the latter have a fantastical aspect, which is purely situational (contextual). For example, a bird confronting a crab or crustaceans competing with spiders are not the stuff of ordinary life! Although there is nothing fantastical about a bird, crab or spider per se. Magic Realism is a literary and artistic genre in which realistic subject matter or narrative is portrayed in a naturalistic way in combination with fantastical elements in order to explore the dichotomy between the rational and irrational aspects of life as it is experienced by the individual. (Regardless of one’s best efforts to order and control circumstances, life is always subject to chance, to the accidental!) This may sound an awful lot like surrealism, but the emphasis is on material objects instead of subconscious or dream images that defy the laws of physics. My second solo show this summer will take place in August. I will post the details as soon as I settle on a title for the show and ascertain the exact starting date, as well. Although, I can report now that it will feature florals in a primarily realist mode with flourishes of the fantastical. 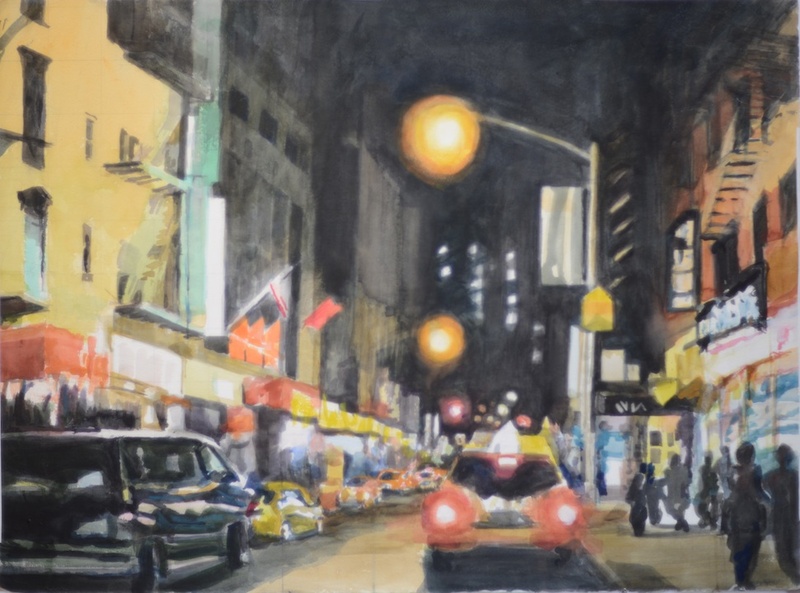 And both of my upcoming shows will be at Berlitz Language Center/Rockefeller Center, 40 West 51st Street, Sidewalk Level (NYC): Site of my first and only previous solo show. I think it is an ideal venue for a relative neophyte to exhibiting solo, such as myself; and a great opportunity to get hands on experience putting together a show in a setting where the stakes aren't as high as they would be in an actual gallery. Also, I know that at least some people there will be giving my art more than a cursory once-over----I've been told that classes at Berlitz view and discuss such exhibitions in order to hone language skills. I hope no one is hesitant to drop in on my show. The people are friendly and the "gallery" area of Berlitz is entirely accessible to the public. No entrance fee, nor appointment is necessary. My first show is May 27 - June 28. Gallery hours are 9:00am - 5:00pm Mon - Fri; 9:00am - 3:00pm Sat & Sun. Additionally, there will be a reception June 4, 6:00pm - 7:30. A Cityscape in the Round: TJ Wilcox: In the Air, at the Whitney Museum. A View of TJ Wilcox's Cinematic Panorama at the Whitney. I'm a lifelong New Yorker and an artist who often draws on the city for inspiration and subject matter. So, I've long been aware of how much Manhattan has changed over the decades, and yet how much it seems to stay the same; of how much history attaches to the place too, both personal and public---- phenomena that the TJ Wilcox's installation at the Whitney, "In the Air," mimics. 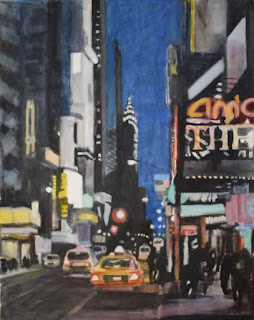 In recent years I've been painting more ambitious cityscapes than the little plein air ones I've long done, so I find myself grappling more and more with what I want them to convey: Do I want to make a realist statement about the insignificance of the individual in a place as vast as New York? A magic realist one about the often random aspect of life in a place as large and varied as this? Perhaps a little of both, as contradictory as that may be. So, it was with great curiosity that I visited the Wilcox show and made note of his take on the city. And, Wilcox's panorama of Manhattan is nothing if not contradictory, showing both the exuberant creativity of New York artists and the destruction that has been visited upon the city, too. 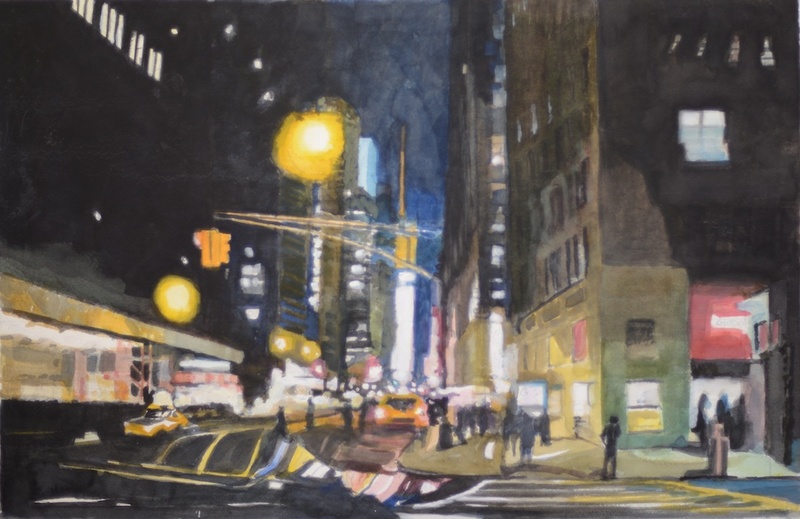 I always enjoy viewing other artists' portrayals of New York precisely to see their take on it. And I wasn't disappointed by this show. The installation is quite large, it takes up most of the Museums's second floor and consists of a giant circular screen, upon which a kaleidoscopic panorama unfolds: According to the installation wall text, the cinema-in-the-round format harks back to the late nineteenth century, when cinema was a new medium. 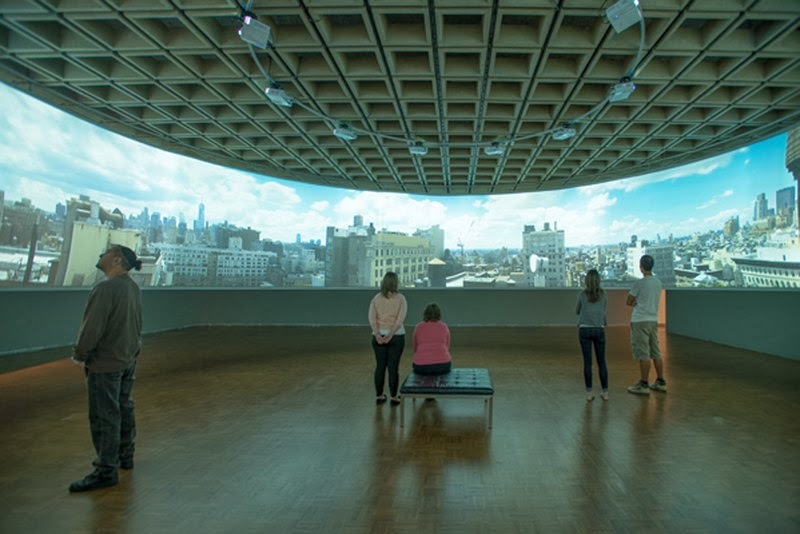 Wilcox's panorama is a 360-degree view of Manhattan, using four cameras, it was shot from the rooftop of Wilcox's Union Square studio on a single day in September 2012----from sunrise to sunset. Using some sort of stop-motion animation technique, Wilcox was able to greatly speed up the fifteen hours between dawn and dusk to fit a half hour long format; that serves as a backdrop or framing device for six short narrative films that are shown sequentially. The narratives range from the distant past to more recent events. Taken together, they form, as much as anything, a meditation on the interconnectedness of past and present, both imagined and real; and of the intersection of personal memory and the historical record. There is no real logical progression from one vignette to another. Yet there is just enough thematic similarity between some of the narrative films to make them seem to tie into one another: The vignettes "Futura" and "John," are an example, each relates a large-scale catastrophe that left an indelible mark on the public. The former, the crash of the Hindenburg; the latter, the terrorist attack on the World Trade Center. Obviously, there is no rational connection between the two events, the only tie-in, the theme of catastrophe and collective trauma. Similarities that are arbitrary, without any factual relation. Yet, in the viewing of "In the Air," random similarities seem to take on the aura of significance. 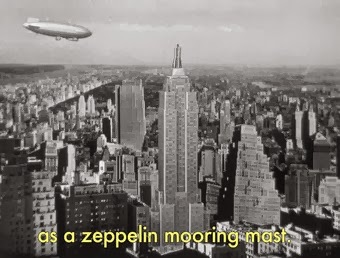 "Futura" uses old news footage showing the Hindenburg crash interspersed with Wilcox's filmed mock-up of an apparently actual, unrealized, plan to use the Empire State Building as a docking station for dirigibles. I must say, I thought the mock-up was one of the panorama's more amusing touches. In it, people are shown on a very flimsy looking gangway extending from a blimp to the top of the Empire State. It added a note of levity to an otherwise tragic subject. "John" uses the superintendent of Wilcox's building to relate the attacks on the Trade Center. By using his superintendent's eye-witness account, instead of news footage, Wilcox establishes the interconnectedness of personal memory with that of the public account. Of course, Wilcox didn't have to show us images for us to visualize what happened that day. We saw the attacks televised, over and over. But the super's matter-of-fact narrative makes the events more relatable, seem less mythic, more down-to-earth: He describes going from incredulity, to horrified realization----not unlike the reaction I had to telecasts of the attack! cinematic panorama: "In the Air." I was also amused by the vignette "Silver Cloud." 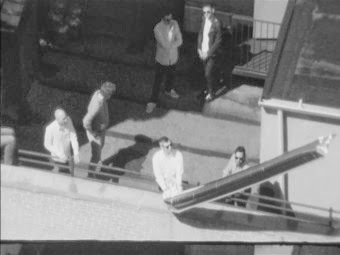 It shows footage shot from Andy Warhol's 47th street "factory" rooftop in 1965, interspersed with newscasts of the papal visit of Paul VI. In the film a helium filled silver phallus is being launched aloft while the pope's motorcade passes below. It's a little hard to believe that the film's narrative arc is entirely authentic. I'm guessing that the launch was shot separately, then added to news footage of the papal visit. But the conceit of the pope receiving a phallic salute on his visit to the city is very funny. Like "Silver Cloud,"most of the short narrative films are collages, mixing footage from several sources, such as old news reels and recreations or re-imaginings of events. And, it isn't always clear what's what, blurring the distinction between fact and fiction. "Manhattanhenge" is the last of the six vignettes. It shows the biannual phenomena of the same name. As natives such as myself probably know, Manhattanhenge is a phenomena that occurs every spring and summer: On the equinox the setting sun aligns with the basic street grid in Manhattan, so that the sinking disc is visible on the major cross streets, at least those with an unobstructed view such as 57th and 42nd streets. As you may already know, Manhattanhenge is a neologism derived from Stonehenge. So, the closing vignette creates an allusive association between Manhattan and a bi-gone and mysterious people. I suppose the suggestion is that one day the sun will set permanently on Manhattan as it did on the civilization that created Stonehenge. I regret not having seen "In the Air" before. It is an enormously original vision of New York: past and present; factual and not. Yet "In the Air" seems so authoritative and all-encompassing that it seems like much more; almost like a definitive portrait of the city. TJ Wilcox: In the Air ends February 9. Whitney Museum, 945 Madison Avenue (at 75th St.), NYC.